SCARF SOLD SEPARATELY - REVAMP ANY ROOM: A pretty curtain changes a room´s entire appearance! Choose one of our elegant curtains to match your furniture and colour schemes. Perfect for living rooms, bedrooms, offices, kids´ rooms and more, they are guaranteed to add a touch of finesse and luxury and finesse to your home! PERFECT SIZE: Each panel of our curtains measures a 54'' width and a 84'' length. The two pieces reach a combined width of 108'', enough to cover any window and decorate the proper part of a wall.Hang with a decorative or standard curtain rod, up to 2" Diameter. EASY WASH: Under normal circumstances, you need to wash your curtains only a few times each year, but it doesn't have to be a hassle. 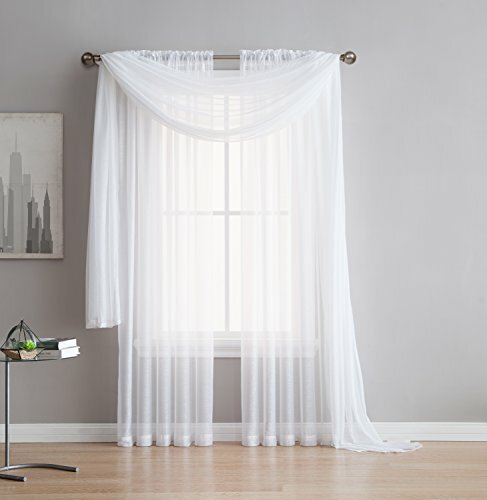 Our sheer curtains, due to their durable material, can be safely machine washed. Be done in a single wash cycle, and return them to your windows, as fresh as ever.